Widmer Brothers | Beer Apprentice - Craft Beer News, Reviews, Interviews and Info. Hi guys. For today’s craft beer review I’m going to be trying the Barrel Aged Brrrbon ’11 produced by the Widmer Brothers Brewing Company located in Portland, Oregon. I haven’t had a whole lot of experience with Widmer Brothers, so I don’t really know what to expect with this brew. I checked on their website, widmer.com, and found this description. Barrel Aged Brrrbon ’11 is a smooth winter warmer and the first release as part of the Alchemy Project. Following the initial brewing process of Brrr, the beer was given a fresh charge of hops during secondary fermentation and then put into Kentucky Bourbon Barrels and aged for four months. After barrel aging, the beer was allowed a tertiary fermentation for final conditioning before release. Ok. Let’s give it a pour. This brew came in a 22 oz. bottle and it had an ABV of 9.4%. It poured a semi-hazy, caramel/amber color. The crown was off white, sized well, kind of smooth and soft. The retention time was decent and the lacing looked alright too. Some clear alcohol lacing was noticed on the sides of the glass as well. The nose released a medium strength waft of Bourbon. Hints of caramel and toffee with a slight flutter of vanilla. Tones of lightly toasted breads were also accounted for. A very insignificant amount of wood and/or oak began to protrude as the brew warmed considerably. The fragrance was very meek and docile. I was expecting much more from the bouquet to tell the truth. Oh well. The flavor discharged an intermediate relish of Bourbon. Some caramel and toffee malts added some sugary, sweet connotations also. A very, very light note of vanilla bean was noticed along with a very subtle amount of wood/oak. To be honest, the woodiness was really only noticed at the very end of the glass. All in all, not too bad, but not extremely potent for a barrel aged beer. It did have a few of the proper characteristics nonetheless. The mouthfeel was medium bodied. Smooth, a touch chewy, yet not extremely dry. It did have some very nice warmth though. The carbonation was of medium strength and an ok amount of flavor was left behind after each sip. Well, this beer was just kind of mediocre for me. It just seemed way too muted and relaxed for a Bourbon barrel beer. I think it would be a great introductory beer for someone if they were interested in exploring a Bourbon barrel beer for the first time. It was straight forward and easy drinking. Even though it does go down relatively easy for a beer of this size, I think it would still be best when had during the cooler months. 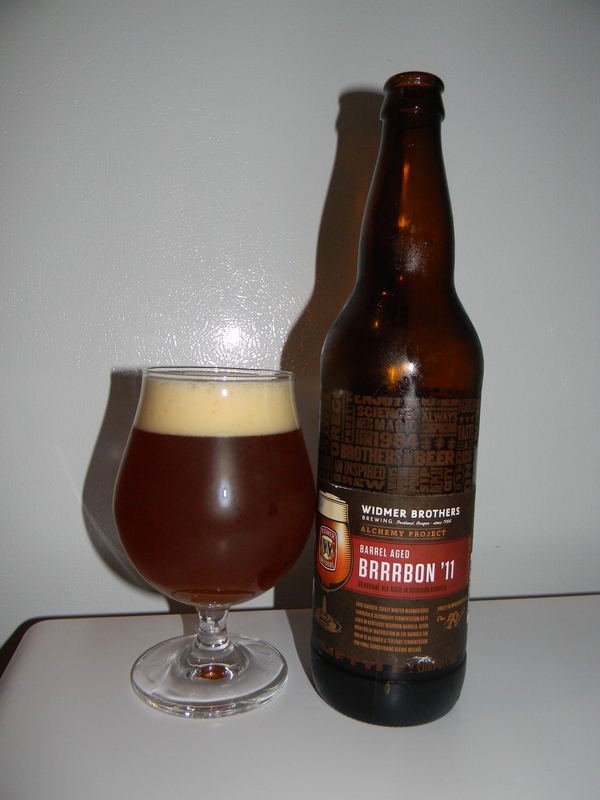 Either way, give the Widmer Brothers Barrel Aged Brrrbon ’11 a try if you have yet to do so and see what you think. Be sure to leave a comment if you wish too. 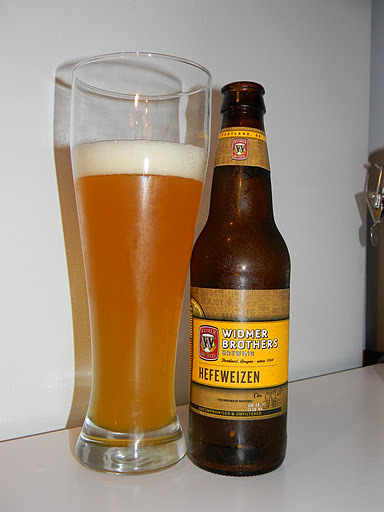 For today’s craft beer review I thought I would review the Widmer Brothers Hefeweizen brewed by the Widmer Brothers Brewing Company located in Portland, Oregon. I’ve never tried anything from this brewery, so when I saw this bottle sitting on the shelf of my liquor store, I figured I would give it a try. From the website, widmer.com, we find this description. Meet the beer that started it all. Our naturally cloudy flagship brew starts with the highest quality wheat. It’s bold, clean flavor and pronounced citrus and floral aromas are what define American-Style Hefeweizen. So pour yourself a cool, cloudy glass, finish with a lemon and enjoy the original. How about a pour? (And I’m definitely not putting a lemon in this thing). This brew has an ABV of 4.9% and comes in a 12 oz. bottle. It poured a very cloudy, yellow/gold color. A bright white head was formed from a fairly aggressive pour that was soft, fluffy and soapy. It was less than average in size; the retention time was mediocre and the lacing was substandard. The aroma revealed hints of yeast, coriander and pepper. Some fruity sweetness, akin to orange and lemon citrus, was easily noticed also. It was somewhat floral with some wheat characteristics too. Some clove came through to add even more spice character. The aroma seemed to be well balanced, however I found it to be rather mild and meek overall. The taste showed a little more “kick” by way of the spices. It seemed much more peppery and the coriander and cloves added a nice compliment. A slight tartness was tasted from the light lemon and orange citrus. Only the most remote banana redolence was noticed. Plenty of wheat and yeast add some “earthiness” to counterbalance the fruit and spices. The mouthfeel was medium to light, kind of watery, crisp and snappy. It was quite thirst quenching and refreshing and a little bit of flavor was left behind on the palate for me to enjoy between sips. To be completely honest, this brew was only “average” in my opinion. It didn’t do anything to separate itself from the other Hefeweizens out there. It wasn’t anything bad or off putting and I’m sure that this brew would be an outstanding choice to gulp during the warmer days of Spring and Summer, but I was just hoping for something a little more full flavored and bold. It was very easy to drink and would make for a great session brew, however I don’t think I would go out of my way to try it. If you see it, sure, pick it up and give it a go, but don’t expect a world class beer here. Just a decent representation of the style. Thanks for reading and commenting everyone. I really appreciate all of you guys. Until next time.